In early March of this year, about 6,000 smuggled photographs of torture victims in Syrian regime jails were leaked on the internet and published on various web sites. The eyes of parents, siblings, partners and relatives of Syrian detainees became transfixed on their screens. Sorting through pictures of hardly-recognizable corpses, they wondered if they might find a trace of their loved ones. Known as the “Caesar” photographs, in reference to the pseudonym of the defected Syrian sergeant and forensic photographer who smuggled the images out of Syria, the photographs inevitably lead us to question the morality and ethics of disseminating graphic portrayals of dead bodies on the internet. Important as it is, however, any normative debate in this case would sound almost preposterous and a form of intellectual temerity once we realize that what those pictures revealed was the tragic fate of at least tens of prisoners whose destination had been unknown for months or even years. It is, without a doubt, unspeakably painful to first learn about the fate of a son, husband, or sister through a leaked photograph on the internet. Yet for those who spent months and perhaps years begging prison guards and intelligence officers for a scrub of information about their detainees; for those who were repeatedly blackmailed by informants throughout the search; for those who waited in vain and oscillated between hope and despair: for them, these images, harrowing as they were, represented a rescue from endless nights of waiting, releasing them from the indefinite confinement of the shackles called hope. More “fortunate” Syrians learn about their family members’ death under torture through a phone call made by security services, one in which they are told to come and pick up the identification and any personal possessions the deceased has left behind. Victims’ bodies are not delivered back to the family for proper burial; the official cause of the death remains “unknown;” and people are deprived even of the right to mourn their dead or clutch at a physical evidence of their loss. But with hundreds of thousands of imprisoned and forcibly disappeared Syrians, many do not have the “privilege” of learning about the death of their loved ones first-hand. They are either forced to wait and hope, or be left to the mercy of serendipity and, as happened with the Caesar photographs, find out about their death through a leaked image of the corpse. Since the publication of the leaked torture photos in early March, tens of victims were identified by their families. Those included at least 65 photos of Palestinian refugee victims recognized either by their families or by activists. The names of these victims were documented by the Action Group for Palestinians in Syria in April. The London-based monitoring group, tasked with documenting human rights violations inflicted upon Syria’s Palestinians, had published a report earlier in March entitled Photos Massacre that listed the names of 39 Palestinian victims of torture and forced disappearance. Their corpses were identified through the leaked images. 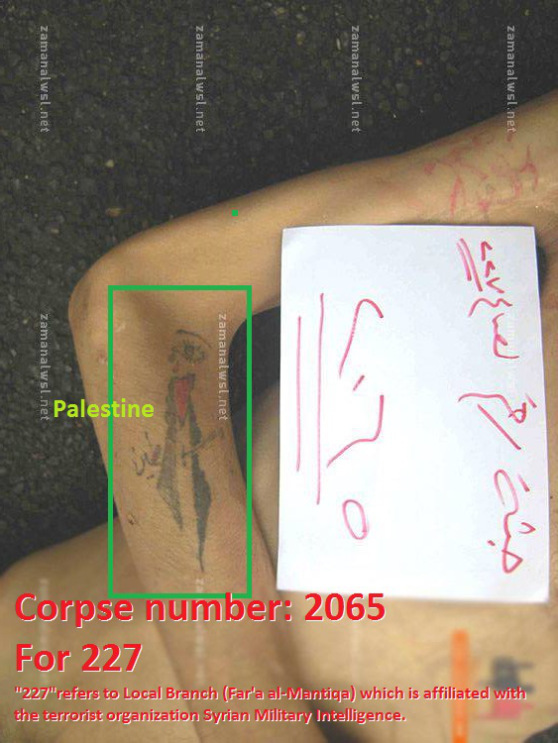 One of the most widely circulated photos was that of a corpse, apparently belonging to a Palestinian refugee, with a tattoo of the map of Palestine emblazoned with the colors of the Palestinian flag. Attached to the corpse, a scrap of paper displaying the torture victim’s number—the coup de grâce toward the obliteration of personhood in Syria’s myriad dungeons. Being confronted by such a wildly symbolic image, it becomes impossible to not wonder: What if that image belonged to a Palestinian prisoner in Israeli occupation jails? Would Palestinians and pro-Palestinians who currently support the Syrian regime react otherwise if the caption on that picture were altered and if it stated that he was killed in an Israeli prison rather than in a Syrian one? One could be forgiven for assuming that, had this man died in an Israeli jail, his picture would become iconic among Palestinians and supporters of their cause, and would be pointed to over and over again as yet more proof of Israel’s brutality and Palestinian defiance in the face of it. It is precisely the identity of the perpetrator that deems the images of Palestinian torture victims in Syria invisible, changes their status from revered martyrs and heroes to contested numbers, and renders their plight unworthy of our solidarity. Since the eruption of the Syrian uprising in March 2011, more than 400 Palestinian-Syrians have been killed under torture in Syrian regime jails. When this fact is presented to Palestinians who support the Syrian regime, some of them dispute it, some have the audacity to dispute it and even claim that those mostly innocent civilians and peaceful activists had been actually killed by ISIS or Nusra front. Others simply say that, “Now is not the time; there are more important things to talk about.” For them, those thousands of Palestinians who have been either killed, imprisoned, or displaced by the Syrian regime are a superfluous group that needs to be dislodged, overlooked and sacrificed for a “greater cause”—that is, the liberation of Palestine—as if the liberation of Palestine means anything when Palestinians in a neighboring country die in their thousands while we look away. Thus, when we affirm that our freedom and dignity as Palestinians cannot come at the expense of others, including our fellow Palestinians, we are described as naïve. They ask that we regard the deaths of fellow Palestinians at the hands of the Syrian regime and the siege, destruction and shelling of their camps little more than irrelevant minutiae that must be shrugged off for far more significant geo-political considerations. Hassan Nasrallah says that the road to Jerusalem goes through Syria. The revered resistance leader must know what he’s talking about. Little does it matter that this road is paved by the blood of hundreds of thousands of Syrians; little does it matter that taking this road means treading upon the dignity and rights of a people who have historically supported our cause like no other—and not thanks to the regime but in spite of it. It doesn’t even matter that Hassan Nasrallah’s road is filled with the corpses of Palestinians killed by the regime or that his compass is directed towards perpetuating oppression and monopolizing resistance. One has to be pragmatic, they tell us, and we do not have the luxury of choosing our allies according to our ideological convictions. This is used to justify siding with and cheering on the Syrian and Iranian regimes and Hezbollah, just as it was previously used in the 1980s to support Saddam Hussein. “He scared the hell out of Israel!” they told us. This was supposed to be sufficient to make us overlook the fact that he gassed thousands of Kurds to death or that he committed unspeakable atrocities in Kuwait. Just as we are today being asked to overlook the suffering of Syrians and Palestinians at the hands of the Syrian regime for the purported “greater cause,” we were being encouraged to chant for Saddam and hang his pictures on the wall. He too, they said, was an enemy to Israel. We hypocritically deny them the very same pragmatism that we adopt to rationalize our support of oppressive regimes. We fail to understand that for Zabadani’s Syrians, Iran and Hezbollah are occupying forces trying to uproot and ethnically cleanse them, precisely the way Israel has been doing to us. We fail to understand that the Syrian regime and its allies have become to them what Israel and the United States have been to us. And so we do not take a minute to put ourselves in the shoes of Syrian resistance fighters in Zabadani who, for two months, have somehow thwarted a far more superior military force, backed by non-stop aerial bombardment. If we continue to believe that Hassan Nasrallah’s road to Palestine is the only one open to us, we do not have the moral ground to condemn those who falsely or misleadingly claim that their road to salvation is through peace with Israel. Combatting all the no-longer-ulterior agenda to normalize the relations between Syrians and Israel cannot be achieved by supporting Assad and Nasrallah. It starts with explicitly and vehemently refusing that our cause be used to condone the killing, humiliation and subjugation of Syrians; it starts by re-affirming our commitment to Syria’s liberation of all forms of oppression. It starts by realizing that our liberation struggle cannot and will not treat Syrians as pawns. Unfortunately, Palestinians will continue to be killed in Syrian regime jails and so will Syrians; Palestinian camps will continue to suffer under Syrian regime siege and so will Syrian towns and cities. True solidarity with the Syrian people and with Syria’s Palestinians requires us to stand firm in the face of the regime that carries prime responsibility for this. And for one, our solidarity must be principled rather than selective; it has to be based on the universal values that the Palestinian liberation struggle and the Syrian revolution are based on. 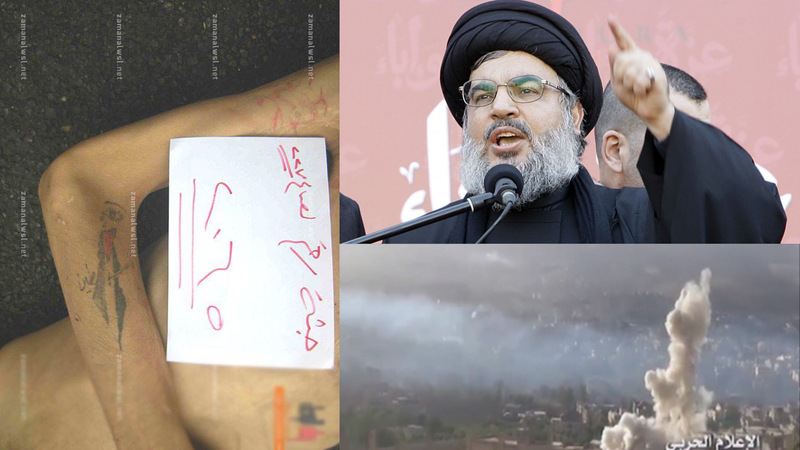 It cannot be modeled on the identity of the oppressor, or dictated by the tone of Hassan Nasrallah’s speeches. Posted on August 20, 2015, in Middle East and tagged Palestine, Syria. Bookmark the permalink. Leave a comment.